Don’t tell your grandmother, but it’s time to head back to the old country of Dorchester to catch the Fiddlehead Theatre Company’s excellent new production of Ragtime: The Musical now playing at The Strand Theatre. The City of Boston is investing in reinvigorating this storied old theater as a center for arts and culture in the city, particularly for the communities of Dorchester, Roxbury, and Mattapan. Ragtime is a particularly poignant show for the occasion, offering an epic story from the turn of the previous century, just prior to the opening of the Strand itself. With its focus on a segregated society of WASPs, African-Americans, and Jewish immigrants in New Rochelle, N.Y. — and what happens when those groups interact with each other — Ragtime could be the story of the history of Dorchester itself. But the musical, based on the novel by E. L. Doctorow, spins a tale of social evolution and personal assimilation, societal injustice and individual kindness, which explains why this production is sponsored by the ACLU. In the hands of playwright Terrance McNally, lyricist Lynn Ahrens, and composer Stephen Flaherty, though, Ragtime never feels preachy or didactic. It’s simply a great evening of theater. You know you’re in for something special from the opening number, which skillfully introduces not only 15 characters, but also the social dynamics at play among the three groups, made vivid through Anne McAlexander’s choreography and Jennifer Tremblay’s costumes. Meg Fofonoff’s direction keeps the story moving at a pace that belies the show’s three-hour length, and with a couple of brief exceptions in the second act, keeps the various plotlines clear. The 16-piece orchestra under the baton of Matt Stern is thrilling. “Back to Before” may be Mother’s final anthem, but it’s not Ragtime’s, and therein lies one of the few problems with the show. The score, while beautifully reminiscent of the best Americana music, is overstuffed with anthems, from “Wheels of a Dream” to “‘Til We Reach That Day” to “Make Them Hear You.” While each song is worthy, all that declaration of purpose gets exhausting. Still, each carries an important message that resonates today, whether it’s about the pursuit of justice, the direction of progress, or the power of the American Dream. This is a show that will leave you not only humming the songs; you’ll also be discussing their messages. At least you will once you wipe the tears away. On second thought, Ragtime may be the perfect reason to grab your grandparents and bring them back to the part of town they likely haven’t visited since their families fled to the suburbs in the fifties. Have them show you where they used to live and which churches used to be synagogues, and then after the show, talk about the issues raised by the performance and what we can do about them today. RAGTIME runs at Dorchester’s historic Strand Theater, 543 Columbia Road in Boston, through October 7, Fridays and Saturdays at 8 p.m., Saturdays and Sundays at 2 p.m. and Thursday, October 4, at 7:30 p.m. Ticket prices: $45-Orchestra, $39-Mezzanine, $35-Balcony, $32-Seniors and Children, $25-Students. For tickets or more information, please call 866-811-4111 or visit www.fiddleheadtheatre.com. For more information and group sales (10 or more), please call Show of The Month at 617-338-1111. 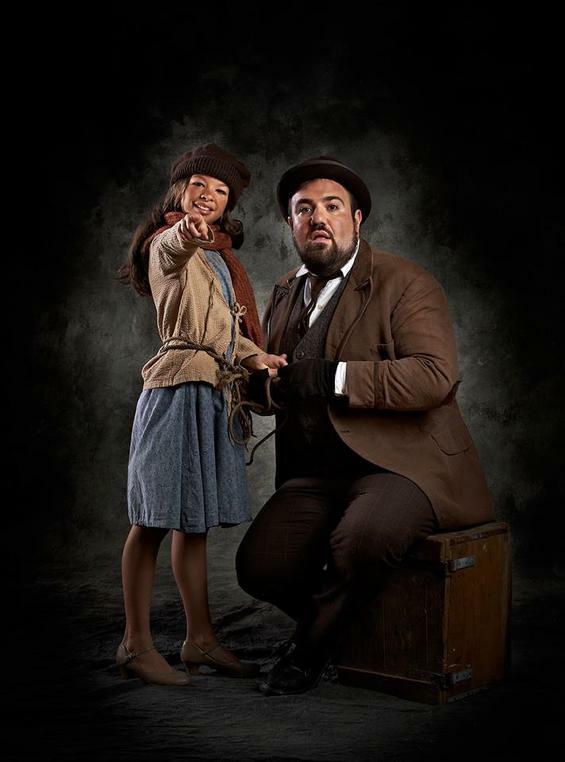 Photo of Adam Shapiro as Tateh and Julia Deluzio as his daughter by Matt McKee Photography. Most of our holidays commemorate specific events: Passover recalls the exodus from Egypt, Hanukkah the rededication of the Temple following a military victory against the Greeks, Yom Ha’atzmaut the founding of the modern State of Israel, and so on. But Sukkot is different. Sukkot reminds us of the time between the Exodus and our ancestors’ entry into the promised land of Israel. 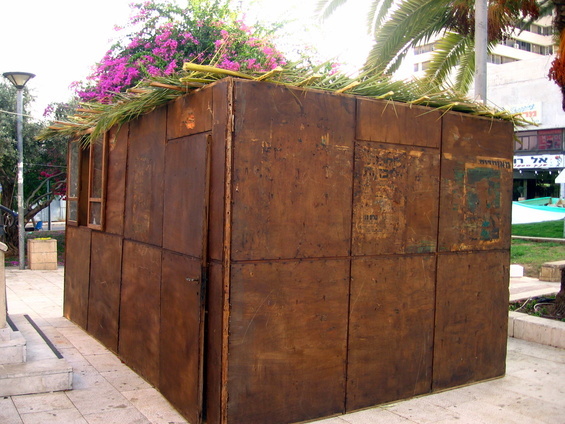 Jews remember this time of wandering in the dessert by building temporary dwellings, little booths called “sukkot” (singular: sukkah) from which the holiday draws its name. As with most Jewish practices, there’s wide variety in how people interpret what it means to “dwell” in the sukkah during the week. Some people eat big meals in their sukkot. Others will only eat in a sukkah and refrain from eating anything more than a snack outside of one. Some people will sleep in their sukkot as well, which can either be super fun or cold and miserable depending on your location and the vagaries of the weather. Tzimmes is an Ashkenazi specialty generally associated with Rosh Hashannah due to its sweetness. There are as many variations on tzimmes as there are Jews, but the common threads are that it’s a sweet dish made from carrots and whatever else you want to throw in. A common version is “tzimmes with flanken,” featuring short ribs to add a meaty savor. Tzimmes has a reputation for being a big pain in the neck to make — so much so that the phrase “to make a tzimmes” is synonymous with “to make a big deal” out of something. But my family’s recipe is so simple, it’s almost embarrassing to call it a recipe. Even so, it’s delicious and is always a hit when served at holiday meals and potlucks. Better yet, it freezes well and reheats even better. And since my tzimmes relies on sweet potatoes, an autumnal vegetable if there ever was one, it’s perfect for Sukkot, our fall harvest festival. But honestly, I serve it year-round. Preheat your oven to 350 degrees. 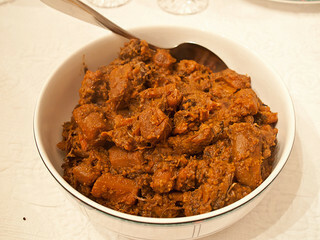 Drain most of the liquid out of the cans of vegetables, then mix the vegetables in a casserole dish. If you’re including dried fruit, add it now. Add liberal amounts of maple syrup and cinnamon. Toss to coat. Slice kishke, laying rounds across the top of the casserole to cover. Bake for 45 minutes, or until the kishke is browned and the casserole is bubbling. Tzimmes photography used under Creative Commons license from Flickr user Edsel L.
Most Ashkenazi Jewish food traditions can be summed up with the sentence, “Our ancestors were poor, and this is what they could afford to eat.” Even so, it’s pretty incredible how creatively our forebears were able to construct themed dishes for the holidays that worked on a tight budget. Stuffed cabbage — known in the shtetl as holishkes — are one such dish. They get paired with Sukkot in part because cabbage is in season now, and in part because two holishkes placed next to each other on a plate look a bit like Torah scrolls, and Sukkot culminates with Simchat Torah, our holiday celebrating the yearly cycle of reading our central text. Today has been a frustrating day on many levels, and surprisingly, at the top of my frustration is two Conservative rabbis who are Facebook friends of mine who have chosen to share an Islamophobic cartoon depicting the Prophet Mohammed. I’m not going to link to it here because I don’t want to have a hand in further distributing the cartoon. I am disappointed to see the rabbis of my generation circulating a cartoon that flagrantly disrespects someone else’s religion, not to mention perpetuates harmful stereotypes. Is this the spirit in which you hope to enter 5773? And to my surprise, instead of saying something like, “You’re right, I got carried away. I’m frustrated but this wasn’t the right way to express it,” both dug their heels in and defended their right to mock Islam in a way they both know specifically insults Muslims. One of these rabbis is a chaplain with the US armed forces. The other holds a significant post in the Conservative Movement in the United States. I have long since disavowed any affiliation with the Conservative movement that was once my home, but incidents like this confirm for me that I’ve made the right choice. I know, I shouldn’t judge an entire stream of a religion based on a couple of vocal leaders, but, well, you see the irony there.